Length: 46 ft. 9 3/8 in. Beam: 10 ft. 5 in. Draft: 6 ft. 9 in. Year Built: 1967. Chimaera is a sloop rig that was built for Frederick Leibhardt, specifically to outrace other San Diego boats like Sally. Chimaera’s design copied elements of Intrepid, the 1967 America’s Cup defender, whose rudder was separated from the keel.“It was a major breakthrough in boating technology,” Driscoll explained. 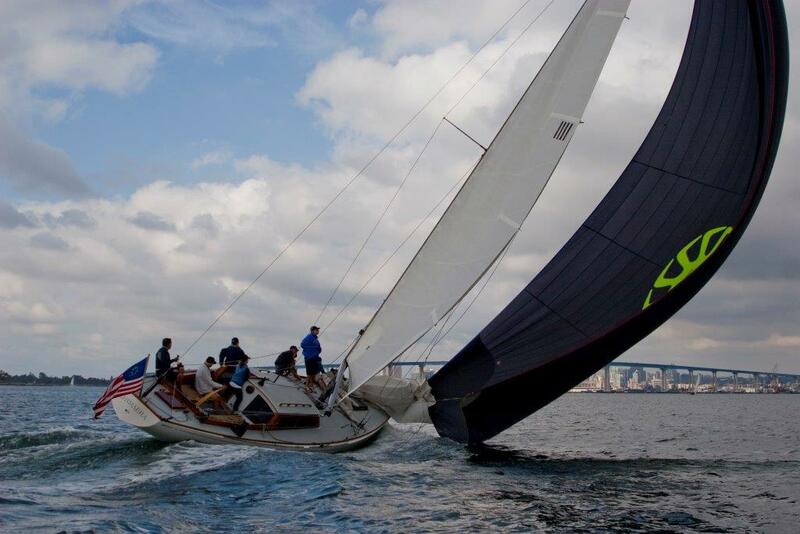 Notable Moments in Boat’s History: Chimaera’s first long distance race was the San Diego to Acapulco Race. The crew was comprised of the “who’s who” of North American yachting :Gerry Driscoll, founder of Driscoll Boat Works and skipper of four America’s Cup defender races; Lowell Orton North, founder of North Sails and Olympic Gold Medalist in the Star Class; , renowned yacht designer, Olin Stephens; Gene Trepte, and Liebhardt. “They led a good part of the race, then parked outside of Acapulco and didn’t make it,” Driscoll said. The crew came in second. Chimaera went on to win the Lipton Cup Regatta in 1970 and placed top two in the Ahmanson Cup Regatta in Newport Beach, Calif., and won most of the local races in San Diego and took every major championship in the area including the Rumsey Regatta and the entire series of individual races that led up to it. Driscoll’s crew also competes in the Hot Rum Series. Recent Notes: Chimaera is on its third life, Driscoll explained, in that it’s gone from a stripped racer to a fast cruiser to a classic race boat. Leibhardt sold the vessel to a man named John Laprade, who modified the entry way. Laprade put the entry at a more conventional place at the aft of the cabin, Driscoll said. There’s a big column that housed the original staircase – the original entry had been patched up but the structure was still there, transformed into the vessel’s electrical distribution center. Scully, the next owner who kept the vessel for 20 years, transformed Chimaera into a long-range cruiser, adding a radar system, steps up mast, bow rollers, and almost 3,000 amp hours of battery to the boat. He also added about 6 feet 7 inches to the mast and made it a fractional rig. Driscoll also gutted the interior. “We took a lot of stuff out from the inside and opened it all up,” he said. He started by wiping out the upper cabinets and putting all storage below the cabin floors. “We even took off the sailing instruments, it’s really basic, which is my general philosophy on boats,” he said. Driscoll, who lives four blocks away from Chimaera, hopes to take her out this summer to Catalina from June through September, but will settle for five or six weeks.